Courgette Restaurant is located just on the outskirts of the CBD in Canberra; not a particularly good spot as it’s a bit in the commercial area but definitely worth locating to try the food. It’s owned by one of Canberra’s great chefs James Mussillon. It’s luxurious inside but also cosy so you feel comfortable in the main restaurant. There are options for group dining in private dining rooms and I have done this a couple of times before for work but I really prefer the main area. One of the special things about the restaurant is the separate private dining room called the Cellar Room which is located [unsurprisingly] in the cellar surrounded by over four-hundred different bottles of wine and seats up to ten people. The restaurant has a great lunch time special with three courses for just $66; I think this is surprising for Canberra in a fine dining restaurant as it’s inexpensive…we commenced with sparkling mineral water and my friend Jane ordered a really nice bottle of French wine (most enjoyable). I started off with a corn fritter dish which was really not your typical corn fritter but came beautifully displayed on a wooden platter with baby corn and a mustard dressing. Jane ordered the Morton Bay bug tail, seared scallop and chorizo with sweet peas, baby kale and fermented black garlic. Jane is a real ‘foodie’ and said both her entree and main course were fabulous. Then for main course I had the roasted heirloom carrots, with crunchy seeds – so delicious…and so beautifully presented. Jane ordered the beef dish which was also so well presented and even I said that being a strict vegetarian. It came with truffled mash, sweet and sour red cabbage with a port and thyme jus. Our desserts were amazing; Jane had the fresh raspberries short bread mille feuille with fresh cream. I ordered the baked hazelnut tart which came with coffee marscapone mousse, and praline dust. Didn’t like the mousse I must say as it was coffee flavoured and I don’t drink or like coffee but loved the rest of the dish. Loved the experience and will definitely return. During a holiday in Hong Kong in 2010, I thought it would be good to get out of the densely populated area of Hong Kong Island, where I was staying and travel up to Sha Tin in the New Territories, where there is a small village called Pai Tau. The main reason I wanted to visit there was the Ten Thousand Buddhas Monastery. So one morning I caught the train from Causeway Bay up to Sha Tin; a pleasant trip as I left early and therefore got seat. So…by accident I found the Po Fook Hill Ancestral Halls, Hong Kong’s largest cremetorium and cemetery. I now know that Po Fook Hill is often mistaken by tourists as the Monastery of Ten Thousand Buddhas, and initially I certainly was mistaken. The location of the monastery is actually above Po Fook on the hill and accessed via the long Buddha lined path but I didn’t walk that far so missed out. All in all an interesting morning but I am still annoyed I never found access to the temple. Dinner on a week night! A friend at work told me about a restaurant that she goes to regularly with her husband on the way home from work and said the food was fabulous. So I knew I had to go there and soon after arranged for three of my friends to come along one weeknight. Abell’s Kopi Tiam restaurant is a combination of Malay and Chinese food with its website saying that Kopi means ‘coffee’ in Malay and Tiam meaning ‘shop’ in Chinese (Hokkein) so it’s said to be named after coffee shops in Malaysia who serve traditional and home-style meals which is exactly what this lovely restaurant did. It’s a rather sweet and colourful little restaurant with chairs and tables outside along with heaters and blankets on the back of chairs as Canberra gets quite cold even in the lead up to winter and I guess some people still like to sit outdoors (not me). We sat inside! My friends ordered the special spring rolls for entree but I didn’t want any as I wasn’t that hungry. My friend Ray was trying to be a bit funny as he knows no-body can eat until I have taken a photo for my blog; so he pretended he wasn’t happy with the presentation of the dish so moved one of the rolls – I really don’t think he will be a food presenter (ha ha). They also shared the red curry fish cakes, the spring onion roti and pork and prawn dumplings – which were absolutely loved by Ray and Nat (but in particular Ray). The restaurant was opened in 1998 by Abell Ong, of Chinese/Malay heritage and his wife who are both from Sarawak, one of the Malaysian states on the island of Borneo. When he arrived in Canberra he said he could not find any authentic Malaysian restaurants so decided to open his own….and I am so glad he did! For our main dishes my friends ordered beef rendang and mixed vegetables with tofu and mushrooms. I ordered the vegan noodles with vegetables. There are many vegetarian dishes on the menu and it’s great to see that vegetarians and vegans are equally catered for with plenty of stir-fries and coconut curries. I found out a funny story that Abell tried introducing fermented tofu (stinky tofu) to the menu, which is another Chinese classic, but I think only loved by the Chinese, and its distinctive pungency wasn’t well received – so off the menu it went! (I say thank goodness). This dish was so good, so tasty…I loved the noodles. I tried the tofu and mushroom dish as well and that was good too but certainly not as good as the vegan noodles. An excellent night and I will return soon!! I think most people like a High Tea…well those of with a sweet tooth anyway. I hadn’t indulged for many years so thought it was time to try the Hyatt in Canberra which has High Tea every Friday, Saturday and Sunday. So a couple of weeks ago my friends Ray and Natalie and I went to enjoy the delicious treats. Parking is pretty scarce at the front of the Hyatt so we drove around the rear, parked and entered through the back doors. It’s a pretty fabulous old world hotel and we entered to an opulent lobby. It’s really lovely and I think it really is a little bit nicer than the front foyer. 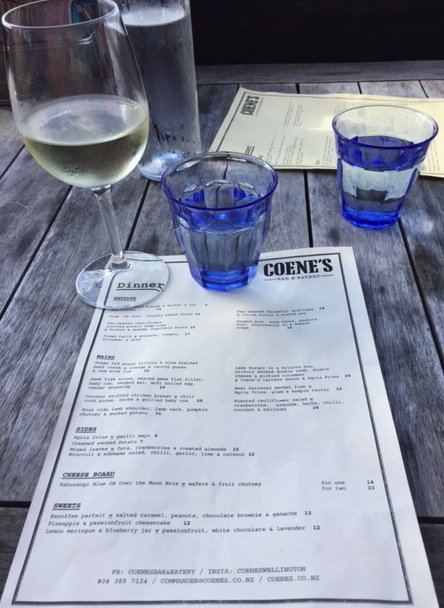 We were shown to our table [a reservation is a must] where we listened to some soft music and our efficient waitress offered us a glass of Australian, Lerida Estate Zenzi, sparkling wine. Unfortunately the sparkling wine was very sweet so neither Nat nor I drank it but we did order a bottle of French champagne to share between the three of us. And that was great!! As we had arrived right on time of opening, we decided to go up to the buffet. For those of you who have been to a High Tea, it’s usually brought out on a three tier tray with a selection of hot and cold foods. However, High Tea at the Hyatt is a buffet and what a fabulous selection of food there is, and so beautifully displayed. It even has a range of sweets on the top shelf of the table; all available to eat. As soon as I arrived I realised I had left my phone at home and knew I wanted to create a post on the visit, so lucky for me, Natalie follows my blog so kindly offered to take all photos. Thanks Nat!! After a sip of champagne, we decided to make a start and chose the hot snacks; vegetarian samosa and mini meat pies. The three of us said that the samosa were just delicious and we went back for a second plate later. I had pre-ordered a vegetarian plate as knew the buffet cucumber sandwiches would contain cheese. My plate arrived and contained a cucumber sandwich, avocado sushi, a pumpkin and rocket wrap and two small spoons of mixed vegetables. My friends then chose an array of hot and cold savoury snacks. We knew if we raced back to the buffet we would be too full to taste a little of everything so we decided on a twenty-minute break between courses. At this time I ordered a pot of peppermint tea which was very refreshing. This really is my favourite flavour of tea. Our next course was the scones with fresh cream and strawberry jam, [a choice of plain or fruit), followed by a couple of other plates of different cakes, pavolva, mousse and pastries. Again managing to wait twenty-minutes between each ‘course’. As I mentioned the food was so beautifully displayed on the table and it was great to see nobody piling too much food onto their small plates. You can go back as many times as you like, so there is no need! I loved all the food but definite favourites were the vegetarian samosa and the strawberry mousse…absolutely delicious. After a couple of hours, we decided we should leave, but the great thing was none of us were so overly full as I really think the twenty-minute gap between plates makes a huge difference. A definite place for visitors to Canberra [and a must for those of us who live here]. 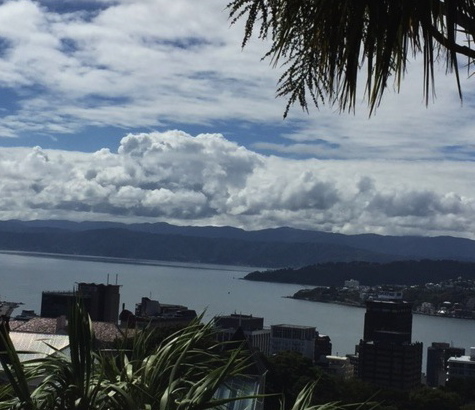 On the last day of my recent visit to Wellington, my friend Nicola drove me to a hilltop suburb called Kelburn. On the drive up I saw parts of the Botanical Gardens and the hillside terraced houses of the suburb. I really wanted to walk through the gardens but I didn’t have enough time unfortunately. 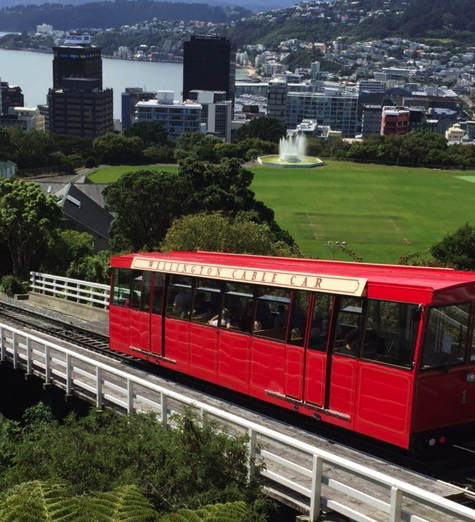 At the top of the hill at Kelburn is the Wellington Cable Car which takes about five minutes into the city. It’s been running for many years and takes about five minutes from the top of the hill to reach the city. 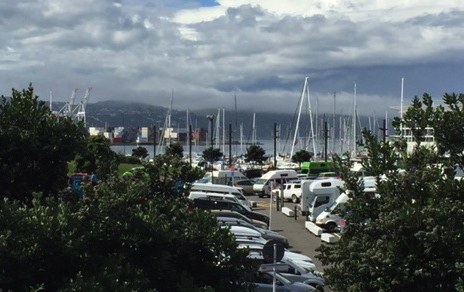 Many of the residents of Kelburn use this mode of transport to get to and from the city every day. 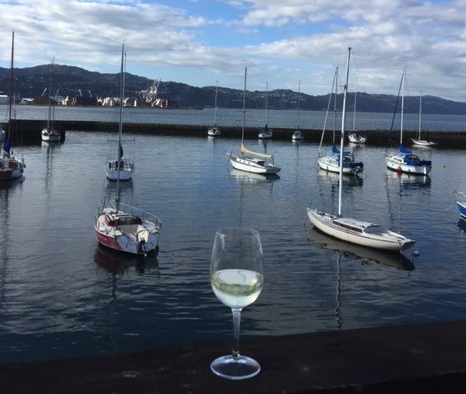 We then went for a drive out of Wellington and upon our return to the city we stopped off at a lovely waterfront pub. 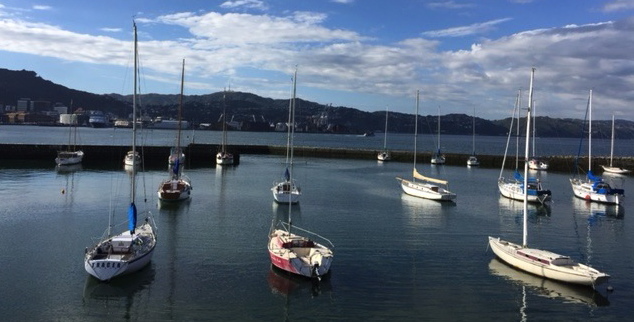 We were lucky on two accounts, firstly the weather was lovely and secondly there was a vacant table outside overlooking the boats and water. 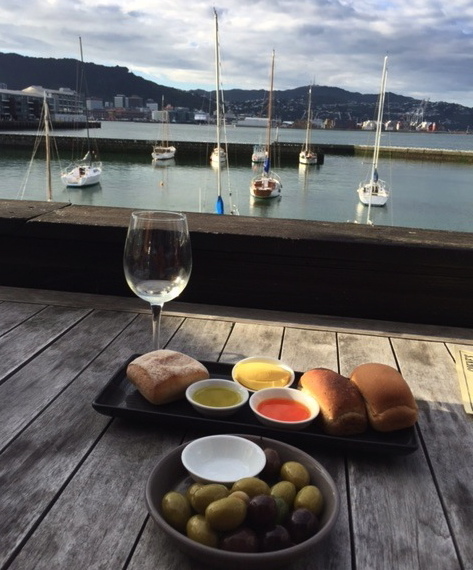 We sat around for about an hour enjoying a glass of New Zealand white wine and Nic ordered some fresh bread with flavoured olive oils and a little bowl of olives. The menu had lots of good snacks but I knew I would be eating on the plane as I had pre-ordered a vegetarian meal, so didn’t order anything else. Then it was time to freshen up before my three hour return flight to Canberra. 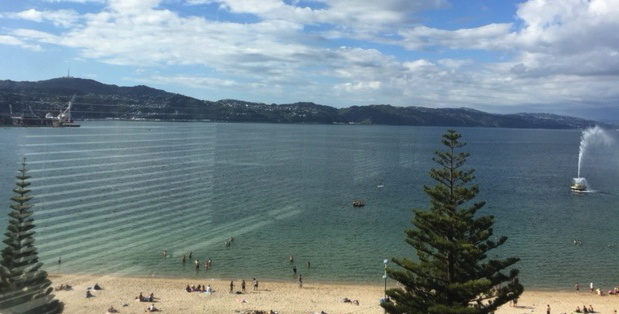 It’s great that it’s a direct flight from Wellington; so much easier than having to stop off at either Sydney or Melbourne. We dropped into my friend’s city apartment and then head off to the airport. 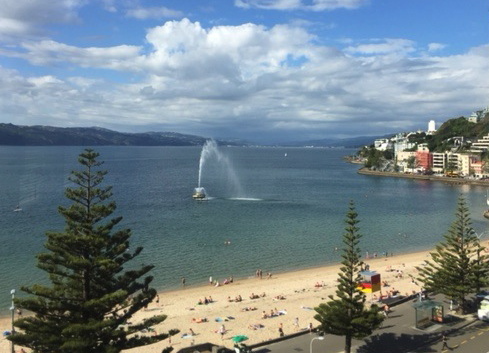 This apartment was stunning with magnificent views of the water. 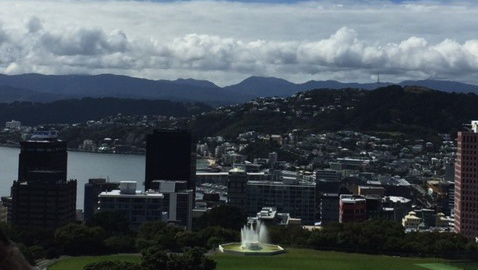 Not sure when I will get back to Wellington but I do know that I would love to visit New Zealand’s other major city; Auckland. Maybe next year! !